Black Soul Gems are magical items from the Necromancy school. 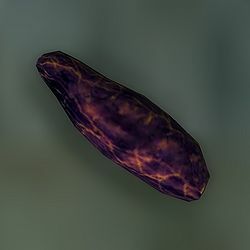 Unlike regular Soul Gems, Black Soul Gems can be used to trap the souls of humanoid races, such as Imperials, Nords, Bretons, Redguards, Orcs, High Elves, Wood Elves, Dark Elves, Argonians, Khajiit and Dremora. General information about using Soul Gems is provided on the Soul Gem, Soul Trap, and Enchanting articles. The rituals necessary to create Black Soul Gems are revealed during the Mages Guild quest Necromancer's Moon, however it is not necessary to do any of the Mages Guild storyline to create Black Soul Gems. First, head to one of these locations: Dark Fissure (east from the shrine of Vaermina), Fort Istirus (east of Kvatch), Fort Linchal (northeast of Kvatch), or Wendelbek (at the headwaters of the Panther River). Outside each of these locations, you will find a white altar draped in a red cloth. Wait for the correct day, namely the Shade of the Revenant (see below for details). If there is no light there when you arrive, you can use the wait command to wait 24 hours at a time. Or you can calculate when the next Shade of the Revenant will occur, go complete other quests, then return on the correct date. When waiting for the purple light, do not stand directly in front of the altar; back up so you can see the altar and a fair portion of sky. The purple light is very soft by the time it gets to the altar, and if you are standing directly in front of it you may not realize it is shining and wait right past it. Also, doing this at night will help. Once the light is shining on the altar, place one or more Grand Soul Gems in the altar (it's a container like a chest). Cast a Soul Trap spell on the altar. When you open the altar again, one grand soul gem is now an empty black one. Repeat step #4 for as many spare grand soul gems as you have. Only one will be transformed for each Soul Trap spell, but you can cast one spell after another. Black Soul Gems can only be created during the "Shade of the Revenant." As part of this phenomenon, a purple light shines down from the sky on each of the four Necromancer Altars. If you continue playing past the last date shown on this table, the Shade will continue to occur every eight days. To determine when the next shade will occur, look at the number of days passed and see if it is a multiple of 8. If it is, then the next day will be a shade day. When you are in jail the count of days will freeze and resume only when you are released. So if you are in jail more than a day, to calculate the shade days use the same procedure but add the number of days you've been in jail to the days that have passed since the beginning of the game. Console codes for all types of Black Soul Gems can be found here. During the Necromancer's Moon quest, you will be sent to Dark Fissure specifically. At 12am on the night of the Shade of the Revenant, a Worm Anchorite will emerge from the cave behind the altar to create a Black Soul Gem. Afterwards, you can steal his new Black Soul Gem from inside the altar, and use it to trap his soul. Starting at level 5 there is a 10% chance that any Necromancer Adept (necromancer boss) will be carrying a Black Soul Gem in their inventory. A list of locations containing Necromancer Adepts is provided at Necromancer Dungeons. The Necromancers in Howling Cave for Meridia's Daedric quest also have a 10% chance of carrying Black Soul Gems. Black Soul Gems can also hold non-NPC souls, so be careful when fighting normal creatures while you have empty black soul gems. Any Grand Soul Gem already containing a soul (of any type) can also be converted, but it must be one that you have filled yourself. In other words, if you find or purchase a Grand Soul Gem with a soul in it, it won't work. But if you start with an empty Grand Soul Gem then fill it with a soul, it will work. Any Grand Soul Gem that you have filled yourself (i.e., any one that will work) will have a value of 200 gold (see Soul Gems). A Grand Soul Gem will lose its stolen flag when turned into a Black Soul Gem. At earlier levels Black Soul Gems are the easiest way to enchant powerful items as you will not be encountering any creatures with Grand Souls until much later on, and Black Soul Gems are much more powerful than the early Sigil Stones you can acquire (they have less overall charge but the effects can be much more powerful). There will be many opportunities to capture the soul of an NPC, especially bandits, highwaymen, and all the Necromancers you must kill during the Mages Guild quests that occur after Necromancer's Moon. Dremora, Golden Saints, and Dark Seducers are considered NPCs; they can be useful for filling up Black Soul Gems if you can summon them. When a non-NPC soul is trapped into a gem, the game engine will prefer to put it into a normal gem before filling a black soul gem. However, the game will fill the black soul gem with a soul before filling Azura's Star. The quest-specific "Black Soul Gems" needed for the Cheydinhal Recommendation quest are not truly Black Soul Gems: they cannot be used to trap NPC souls. Furthermore, using these soul gems is not recommended (see the quest bugs). A glitch exists which allows you to create multiple Black Soul Gems from the same Grand Soul Gem. If you place at least three (Some say two) filled Grand Soul Gems grouped on the same inventory line into the altar and cast the Soul Trap spell, all three will still be present along with the Black Soul Gem when you open the container. You can repeat this process, but all the gems must be removed and returned to the altar each time, or the entire group of Grand Soul Gems will disappear once you have cast an equal number of soul trap spells as there are gems in the group. This page was last modified on 18 October 2018, at 06:15.